experiment to measure wind speed. 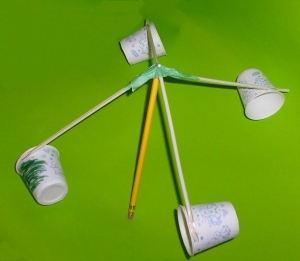 Making their own anemometer, gives kids a chance to think about wind, wind speed, and how to measure it. 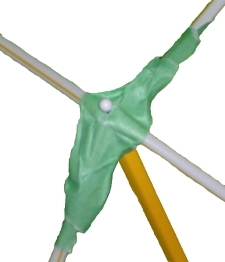 Continue reading " Wind Speed Anemometer"
Lay out the straws into a cross shape and tape them together. Staple one of the cups to the end of each of the straws. Be sure the cups are all facing the same direction. 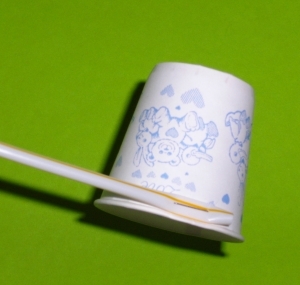 Push the pin through the center of the straw cross and into the top of the pencil eraser. Make sure the straws can spin freely. Use the marker to color one of the cups to make it easier to count how many times the the cups go past when the wind is blowing. If it's a calm day, use a hair dryer to create your own wind. Find out more about what makes the wind blow and hot air.